The scented air freshener diffuses the selected fragrance throughout the passenger compartment from its location in the ventilation system. After setting the desired level of comfort, the system then automatically controls this level according to the exterior climatic conditions. This equipment benefi ts from the latest technology: MP3 compatible Audio system, USB port, Bluetooth hands-free kit, MyWay with 16/9 colour screen, auxilliary inputs, Hi-Fi audio system. This subdued passenger compartment lighting improves visibilty inside the vehicle in low lighting conditions. 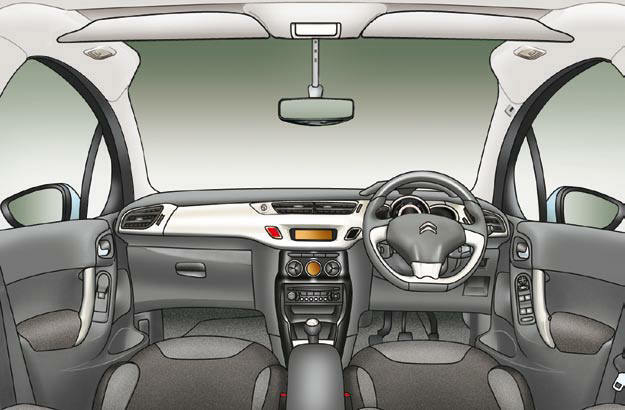 It comprises 4 lamps, located in the automatic day/night mirror support, in the footwells and in the lower dashboard storage compartment. Associated with the manual gearbox, this system suggests when to change up to obtain optimum fuel consumption.